With a small, sharp knife, thinly pare 3 strips of zest from the lemon. Put in a saucepan with the sugar and 100ml water. Set over a low heat, stirring occasionally, until the sugar has dissolved, then allow to simmer gently. While it is simmering, squeeze the juice from half the lemon into a bowl. Peel, core and thickly slice the apples, tossing them in the lemon juice as you do so, to stop them going brown. Then tip the apples and lemon juice into the simmering syrup. Cook for about 12 minutes or until just tender, then tip everything into a clean bowl. Add the Calvados and leave to cool. Cover and chill until needed. 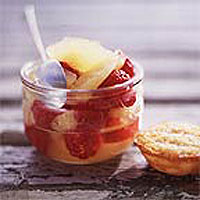 When you're ready to pack your picnic, or serve at home, mix the raspberries into the apples, remove the pieces of lemon rind and transfer to individual small containers or dishes. Serve with little almond cakes.